Pour mon anniversaire ma famille m’a offert un système de mise au point informatisé pour ma lulu Takahashi FSQ106N. Compaticle 100% ascom, il gère aussi la compensation de température. The control unit is a sturdy die-cast aluminium box fitted with a 16 character by 2 line LCD display and three push buttons. The unit is fully ASCOM compliant for use with programs such as MaxIm DL and FocusMax etc., and has been tested with Windows XP, Vista and Windows 7. The unit has a professionally made high quality printed circuit with full silk screen and solder mask for long term reliabilty. The display has a variety of uses which can be accessed via the three push buttons. The centre button is used to select the various modes whilst the outer two buttons are used for manual control or for setting the parameters of the system. The modes available are AUTO, MANUAL, PRESETS, SETUP and TEMP. The default mode is AUTO which is used for autofocus using any suitable ASCOM compliant programs such as MaxIm DL, CCDSoft and FocusMax etc. The focuser position is shown on the LCD display in this mode. When in MANUAL mode the motor can be driven using the buttons on the unit. When a move IN/OUT button is pressed the motor speed starts at a low rate to enable precise positioning and ramps up to maximum speed if the button is held down. 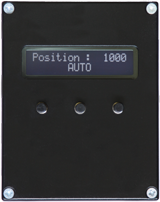 The LCD display shows the focuser position at all times. When in manual mode it is possible to set a backlash value. The PRESETS mode allows you either save up to three positions or goto one of the previously saved positions. This could be useful if you are using the unit in manual and swapping eyepieces or imaging equipment which have different focus positions. Also provided is a special routine for ‘parking’ the focuser which could be useful if you are using a mobile setup. This will allow you to move the focuser to a preset position, e.g. with the tube fully closed for packing away the telescope. Whenever the ‘park’ command is initiated it automatically saves the original position so that on subsequent use the focuser can be returned to that position using the ‘unpark’ command. The SETUP mode provides on screen access to routines to allow you to calibrate the system or to select step size, direction of movement and the backlash for manual use. The TEMP mode will display the temperature from either the internal or optional external digital temperature sensor. The temperature will also be displayed in programs such as MaxIm and FocusMax. Temperature tracking is now provided which will work with all the usual programs such as MaxIm DL and Focusmax to automatically adjust the focus position to compensate for temperature changes. It is recommended that the external temperature sensor option is used for better performance. 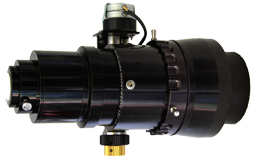 The motor assembly consists of a stepper motor and gearbox with a custom bracket and shaft coupler to suit the users telescope or focuser, shown here attached to a 3.5″ FeatherTouch Focuser. A selection of standard brackets and couplers are offered to fit a variety of telescopes and new brackets are always being added to the range. We would be happy to provide non standard items on request. 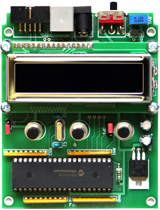 The control unit is wired to use either the internal digital temperature sensor or an optional externally mounted sensor. The external digital sensor needs to be soldered to the 9 pin ‘D’ type connector on the motor bracket. The sensor is fitted with flying leads so that it can be placed exactly where you want it on the telescope. Use of the internal or externally mounted sensor is selected by jumpers on the printed circuit board in the control unit. Note that temperature compensation is not offerred with the unit at this time but may be added later if there is demand for it. Use of the temperature sensor will, however, permit logging and display in programs such as FocusMax. Commandé chez IanKing Imaging en Angleterre, je l’attend dans la boite aux lettre la semaine prochaine.